Women face additional risks of contracting cancer as a result of having Lynch syndrome, including an extremely high risk of endometrial cancer. 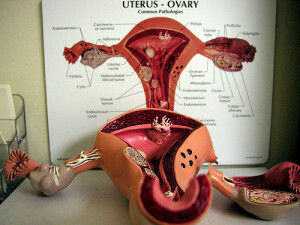 Endometrial cancer may be far more prevalent than previously thought and ongoing research is studying the prevalence. As well, women face an approximate 12% lifetime risk of contracting ovarian cancer, which often appears symptomless and is difficult to diagnose at an early stage. And if a family history of breast cancer exists, discussion with your physician as to whether an additional screening method is necessary. Research into Lynch syndrome is relatively new and in the past there were not yet enough studies to determine evidence of the effectiveness or screenings. In 2012, NCCN guidelines were developed for Lynch syndrome uterine and ovarian cancer risks. These can be located at www.nccn.org. Australian and other international studies have explored the possibility of an association between Lynch syndrome and cervical cancer. The jury is out as to whether or not there is a direct association and/or the extent of that association. It is prudent to obtain annual PAP tests to insure early detection even if you have undergone a total hysterectomy with salpingo oopherectomy. Forewarned is forearmed and in order to protect one’s self, discuss creating an annual screening management program with your gynecologist. For more detailed information on women’s cancers and the women’s risk, MD Anderson has outstanding resources upon their website. Additionally, studies regarding Lynch syndrome women’s cancers are available upon this site, under the LSI Library. Following child-bearing years, to reduce the risks of uterine and ovarian cancers, women with Lynch syndrome should seriously consider prophylactic (preventative) surgery to reduce the high risk of contracting endometrial and ovarian cancer. This is especially important as often there are few or no symptoms of gynecological cancers and screening tests are not all that accurate in detecting women’s cancers at an early stage. The standard procedure utilized is referred to as a full abdominal hysterectomy with bilateral salpingo-oopherectomy (removal of the uterus, cervix, ovaries and fallopian tubes). As a result of modern technology, the surgery today is much easier for recovery and sometimes hospital stays are as short as 5 hours. Nonetheless, it is important to realize it is still a serious surgery and full recovery takes months. Prophylactic surgery, recommended following child bearing years, is often a “win-win” situation, protecting us from Lynch cancers and saving many women the “misery” of having to endure perimenopause, that up to ten year period of time prior to completion of menopause. Over 600,000 hysterectomies are performed each year and by the age of sixty, one in every three women, in the United States, has undergone hysterectomy. Almost 90% of all the surgeries are elective (chosen) procedures, rather than lifesaving procedures. A common practice, the majority of surgeons who perform hysterectomies are pretty experienced. Procedures of the past involved a technique known as total abdominal hysterectomy. Today, women aren’t getting the battle scars of their mothers and less invasive procedures have been developed…the vaginal hysterectomy, the laparascopic hysterectomy and robotic techniques. Today, women sustain much smaller incisions than those which occur with the total abdominal hysterectomy, thus a quicker time of recovery and less pain. A consultation with your gynecologist or surgeon, with a follow up consultation with the anesthesiologist, is the first step. Discussion will ensue as to the type of anesthesia which will be prescribed for the surgery as well as information on the determined procedure will be given. This is the time to ask any and all questions. Be sure and discuss with your physician a follow-up plan for hormone replacement, if desired, which will lessen the effects of hysterectomy and instantaneous menopause. Don’t feel uncomfortable expressing concerns or requesting information. Information sharing is the purpose of the appointment. You may have information which can be vital to your physician or he may have information which is important to you. Open communication with a physician is not only ethical but a patient right so don’t be concerned about sounding “silly.” The only “silly question” is the question that is not asked. Following consultation, testing will be conducted, including a blood panel, a urinalysis, a review of your medical history and stress testing to determine if you can endure surgery. Once the green light is given, you’re ready to roll. If available, you may wish to participate in preadmission procedures and have the necessary insurance documentation and paperwork submitted to the hospital. This will reduce anxiety and alleviate any last minute problems. While awaiting the date of surgery, it is best to stay away from crowded places and sick kids. The last thing anyone wants is to contract a cold or virus while the immune system is compromised. Not only could complications of pneumonia arise but other serious problems such as excessive coughing and sneezing, which could be extremely painful. Refrain from taking aspirin, ibuprofen, naproxen or any medication the week prior to your surgery without permission of your physician. Over the counter pain relief medications may cause excessive bleeding during and following the procedure. Discuss any and all medications, including over the counter medications, with your physician and document when to cease taking medications and when to begin retaking them. The night prior to surgery, you will be asked not to consume anything by mouth. You may be prescribed a laxative or an enema to empty the bowels. Its best not to cheat on the instructions as the ingestion of food or liquids may seriously interfere with anesthesia and create life threatening complications. You may be asked to take a shower and bathe with an antibacterial soap prior to arrival at the hospital. Scrub well and then put on clean, loose, comfortable clothing for the trip to the hospital. For early morning surgery, you may consider wearing a soft night shirt with a robe and slippers. It may be more comfortable than anything with a waistband. Facial makeup is not recommended and you may wish to tie your hair back. Leave all jewelry and valuables at home and only take personal identification and whatever paperwork necessary for admission. After arriving, preparation will take place. Clothing will be placed into a bag or container with personal effects and you may dress in a hospital gown. Most often, you’ll be directed to a presurgical center and a bed where you will cuddle under toasty warm blankets. Staff members will confirm your identity, your history, whether or not you have any allergies to medications and confirm instructions were followed. Relax while they install an IV (a very quick process) and prepare yourself for a long nap. As prescribed medications flow through the tube, you’ll simply drift to sleep. Upon awakening, you will be in a recovery room where you will be monitored until you’re totally stabilized and fully awake. If you are hungry, don’t count on being fed, at least not right away. The hospital staff will want the anesthesia to dissipate from the body before giving you solid foods. Simply relax and roll with the flow. Nothing makes the body heal faster than allowing it to work naturally on its terms. At home, set boundaries while recovering. This is your time. You’ve spent years taking care of your family and its time they took care of you! Relax, sleep, eat, drink lots of liquids and recover. Read books, listen to music and share quality time with your loved ones. At times, you may feel something is wrong, that you aren’t recovering fast enough. There may be tugs, pulls, quick pains…it’s all part of the healing process. Think, “Patience.” The body needs time. It will happen…one morning you will awaken, totally energized and completely recovered. Natural estrogen effects the entire body. Hormone replacement therapy (HRT) may be used to continue those effects following surgery, but may also increase the risk of breast cancer growth. Estrogen helps the release of substances which control the constriction and dilation of blood vesels. Abnormal regulation creates hot flashes. It also controls cholesterol production which limites plaque in the arteries. Estrogen also maintains a balance of bone tissue to deter osteoporosis. However, it also signals for breast call division. This makes cells more suceptable to mutation. Hormone progesterone and various factors also play a role in breast cell division. Be certain to speak with your gynecologist before surgery, in detail, regarding estrogen replacement and the side effects you can expect from menopause. Having a detailed plan, ready in advance, can assist dramatically in a smooth transition following hysterectomy and oopherectomy.